In the previous post, we laid some of the mathematical foundation behind the kalman filter. In this post, we’ll look at our first concrete example – performing sensor fusion between a gyro and an accelerometer. Real world MEMS Gyros and accels have typically two major error sources – bias drift and random noise. There are also scaling errors and cross axis errors (X/Y/Z axis may not be exactly perpendicular), however those errors tend to be small and won’t be considered in our analysis. In the next post, we’ll consider how to set these covariances from measurement logs. The error quaternion is the rotation required to align the estimated orientation with the true orientation. For non-linear problems, the matrix is obtained by linearizing around the local derivative, i.e., we first obtain an expression for . The matrix is called the system dynamics matrix. See chapter 7 in 2 for details. Let’s first consider . This is the trickiest part of the entire EKF formulation, so hang tight! I’ll first mention some quaternion algebra equations that we’ll be using later in the derivation. This algebra is taken from 1with one important difference. In 1, the quaternions are defined as q = [vector scalar], whereas we’ll be using the more common definition: q = [scalar vector]. 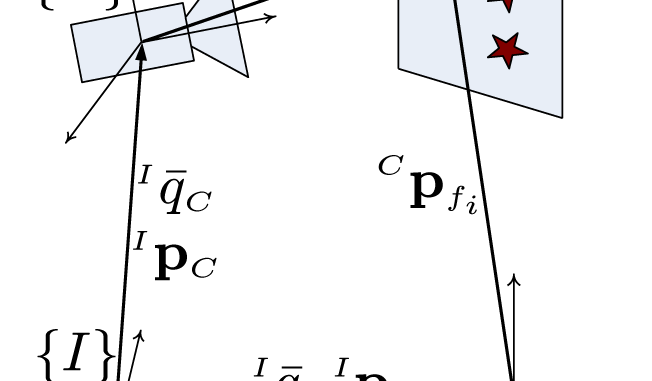 here, is the vector part ( ) of the quaternion. In order to obtain the system dynamics for the error quaternion, we need to express the derivative of the error quaternion as a function of . We are almost there! We have expressed in terms of . However we still need to get rid of . We finally have our system dynamics equation! We’re mostly done with the mathematical heavy lifting. In the next post, we’ll look at the Matlab implementation for all this math which will hopefully clarify the concepts presented in this post. Trawny N, Roumeliotis S. Indirect Kalman Filter for 3D Attitude Estimation. MARS; 2005:24. http://www-users.cs.umn.edu/~trawny/Publications/Quaternions_3D.pdf. Labbe R. Kalman and Bayesian Filters in Python. Kalman and Bayesian Filters in Python. https://github.com/rlabbe/Kalman-and-Bayesian-Filters-in-Python. Published April 22, 2017.